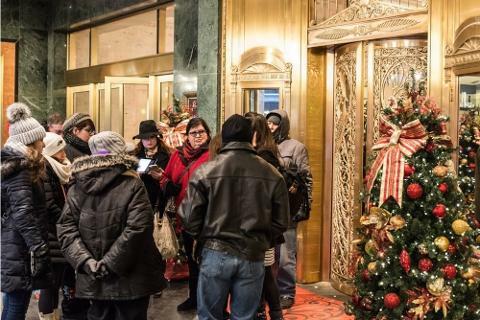 On this special holiday tour, we’ll see some classic Chicago holiday traditions and hear off-the-beaten path stories that you expect from Chicago Detours. Instead of whizzing by Christmas lights from a bus, we’ll walk downtown Chicago to fully enjoy the spirit of the holidays. While we can’t predict the weather, you won’t get too cold! We’ll venture into a few warm locales and talk history over couple drinks. 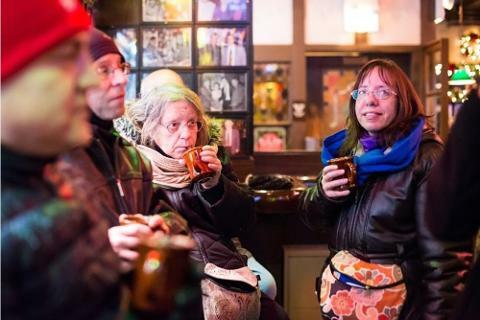 Non-drinkers are more than welcome, too, as this is more than a drinking tour. 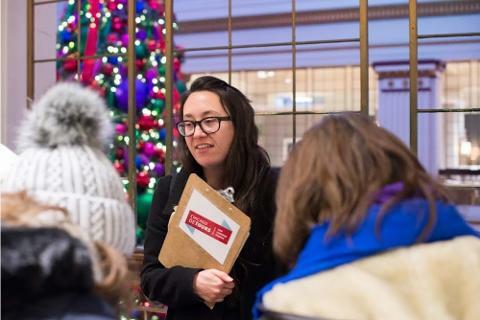 We have some inside stories on our holiday lights tour! Hear about how Mayor Richard J. Daley saved the Christmas Parade, and then how his son, Richard M., was almost awarded a stocking of coal for his affront to Christmas and Hanukkah. Hear the story of Rudolph the Red Nosed Reindeer’s birth in Chicago. We’ll even have an overview of the development of consumerism for Christmas. 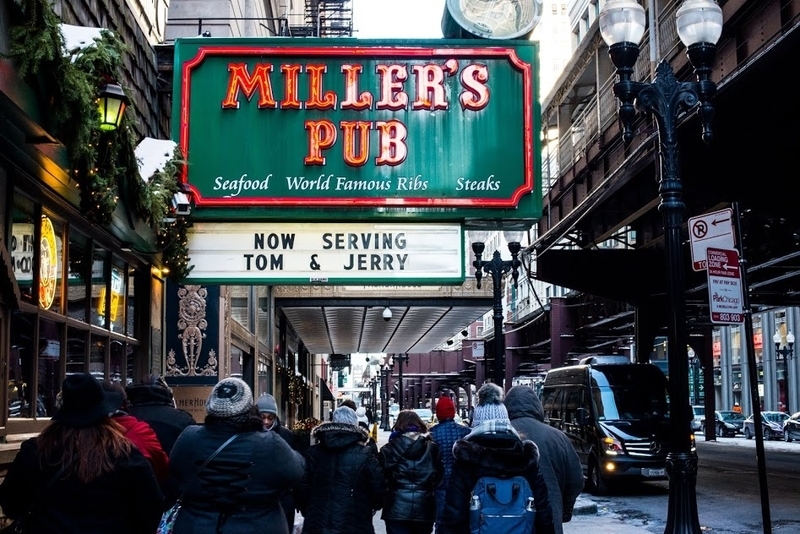 This walking tour is not your typical holiday lights tour of Chicago! The holiday tour has some classic experiences, too. 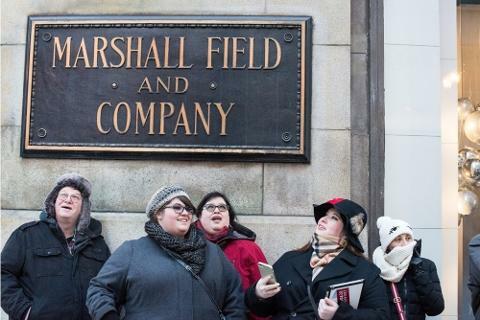 We’ll go into the former Marshall Field’s Department Store, where Chicago holiday traditions have a rich and long history. You’ll have your choice of a beer from the local Revolution Brewery or a glass of wine. 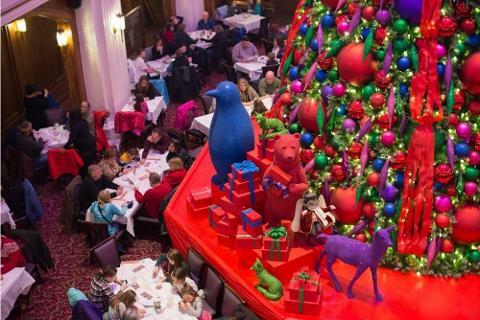 While enjoying those drinks, you’ll gaze at the giant holiday tree in the historic Walnut Room and discover forgotten stories and make new memories. Please be aware that these locations have crowds during this holiday season. We will have to navigate crowds and there may be a wait to get our drinks. Because it is difficult to predict the traffic flows, the duration of the walking tour will be between 2 and 2.5 hours. We’ll be inside half the time, and the other half we’ll be in warm, cozy places having drinks. $36 includes tour guide commentary and gift of Pedway map. Guests bring $24 cash to cover two drinks and server gratuities: 1. a holiday cocktail 2. A glass of wine or local beer. Non-drinkers don't need to bring cash.